Bruce Arnold Jazz Fusion Strat-o-Teacher! Bruce Arnold's credentials and teaching materials are almost endless. 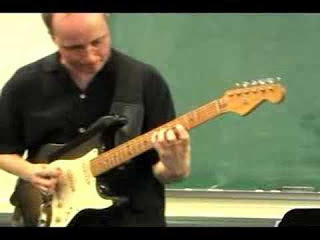 This East Coast Jazz guitarist/professor is immersed in playing guitar, teaching guitar, creating guitar curriculum material and recording with hot rhythm sections. When not teaching at NYU or Princeton, he's either doing clinics or gigging. So anyway... what do ya wanna know already? Bruce was kind enough to send us two very recent releases for review: "Art of the Blues" and "Heavy Mental". Both albums combine into a lexicon of electric Jazz Fusion guitar with definite East Coast flavor. If you wanna get inside the DNA of John Scofield and really dissect that approach, Arnold's Blues release really delivers the goods. Heavy mental moves into Mike Stern & Wayne Krantz zones also providing keys to cracking some Holdsworth code. Click Here for Bruce's "12 Tone Boogie" on Youtube. If it seems like I'm reviewing this stuff as if it were instructional material, this wasn't my intent. But Bruce Arnold's teaching side really blends over into his player side. This is not a bad thing as it describes the musician simply putting high emphasis on articulating his phrasing, vocabulary and influences; points you also expect in a good teacher-clinician. Arnolds music appeals to me both as a listener and someone trying to grasp the feel & vocabulary involved with crossing over from Blues & Rock to Jazz. So, it's very hip all around.